On January 25, 2018, I was certified as a Project Management Professional by the Project Management Institute (PMI). 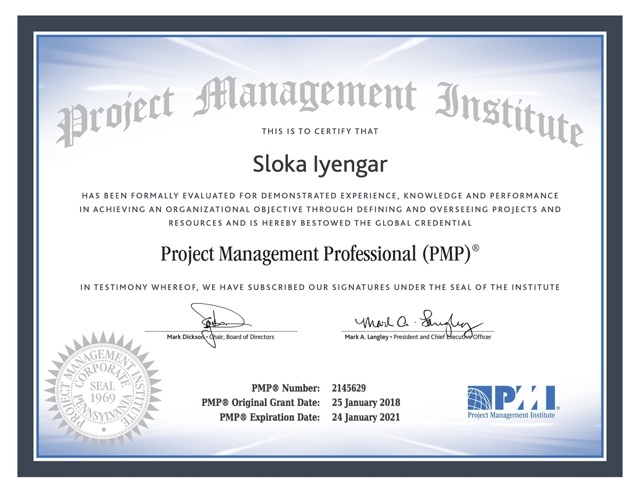 The PMI was founded in 1969 to foster recognition of the need for professionalism in project management, develop common terminology and techniques to improve communications, and provide guidelines for instruction and career development in the field of project management. Certification requires passing an exam on the Institute's Project Management Body of Knowledge (PMBOK). In April 2018, I started as Associate Medical Director with Phase Five Communications, a full-service global medical education company ﻿that excels in mining raw data and creating strategic scientific communications. Phase Five is part of ghg | greyhealth group. From October 2016 to March 2018, I was a consultant with Boston Strategic Partners, a global life-science consulting firm with comprehensive clinical, scientific, and business skills providing a multitude of high-value services to clients in industry-leading turnaround times. November 17, 2017 - "An update on Gates Foundation grant ideas"
September 16 2017 - "Developing a Strategy for Translational Epilepsy Research"
April 7, 2017 - "Precision medicine: an overview"
I represented BSP at the October 20, 2017 Center for Career Education 2017 Engineering Career Fair. As a clinical researcher, I worked from September to November 2016 with Dr. Michael Thorpy at the Montefiore Medical Center on a study to better diagnose patients with narcolepsy and cataplexy. While at Montefiore, I published this article about the role of reactive astrogliosis in epilepsy. Previously, I worked with epileptologists at the Northeast Regional Epilepsy Group and initiated the Brain Tumor-Related Epilepsy Research Consortium. The mission of this Consortium is to improve the quality of life of people of all ages with brain tumor-related epilepsy. To determine if continuous video- EEG monitoring could used for the detection of vasospasm and if is more sensitive as compared to existing diagnostic modalities such as clinical exam, transcranial Doppler and angiography. Click here for the project proposal. Individuals with traumatic brain injury are administered prophylactic anti-seizure drugs (ASDs) for 7 days without a thorough understanding of whether ASDs in this situation are actually beneficial. In this study, we are trying to examine the efficacy of ASDs in traumatic brain injury. Click here for the project proposal. Cannabidiol (CBD) has recently been approved by the FDA for certain cases of intractable seizures. I also worked on a project investigating the effects of lacosamide on mood and quality of life in people with refractory partial epilepsy. The manuscript has been accepted for publication in Epilepsy and Behavior. Lancman M, Fertig E, Trobliger R, Perrine K, Myers L, Iyengar SS and Malik M The effects of lacosamide on cognition, mood and quality of life in patients with refractory partial epilepsy. Submitted to Epilepsy and Behavior. For my postdoctoral fellowship, I worked with Helen Scharfman at the Nathan Kline Institute. Here, I investigated postnatal neurogenesis in the hippocampus and its role in seizure generation and propagation. In this paper, we found that ablation of postnatal neurogenesis increases susceptibility to convulsant-induced seizures. In another paper, we showed that spike-wave discharges in rodent models of temporal lobe epilepsy could be potentially incorrectly mistaken as stage 1–2 limbic seizures. In 2013, I was an ‘Epilepsy Fellow’ – this program is awarded by the American Epilepsy Society to nurture epilepsy professionals and support their career development. For my graduate work, I worked with David Mott at the University of South Carolina School of Medicine, where I used electrophysiology to study synaptic plasticity in epilepsy. I studied neuregulin – a peptide that regulates synaptic plasticity in the hippocampus and its role in epilepsy. In this paper, we discovered that application of neuregulin to hippocampal brain slices can block epileptiform activity in a way similar to long-term potentiation. Neuregulin regulates synaptic plasticity by acting on dopaminergic receptors. We found that in epilepsy, neuregulin regulation of dopaminergic signaling has changed; I am in the process of writing up this manuscript. I was awarded predoctoral fellowship by the Epilepsy Foundation entitled ‘Neuregulin regulation of synaptic plasticity in epilepsy’ from 01/01/2009 12/31/2009. © 2015-2018, Sloka Iyengar. All rights reserved.